It may seem hard to make your home bread with the same consistency and texture as those we get from bakeries. However, with practice you can achieve even better because you can put in more effort and use rich ingredients. 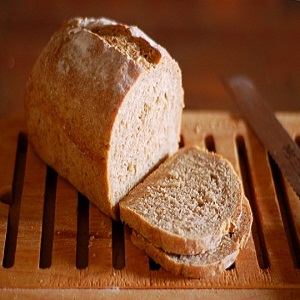 Learn the recipe so that you make your own healthy and delicious bread at home. Take some time and wash your hands and also clean the kitchen work area before preparing this tasty bread recipe. Also, do not forget to wash the utensils, ingredients or any other items that you might be using for making this bread. Take a large mixing bowl. Add to it warm water, yeast, and 1/3 cup honey followed by 5 cups of flour. Combine these well by stirring before proceeding. Let this mixture stand for thirty minutes while you do other steps. The yeast will get bubbly by then. Add 3 tablespoons melted butter, 1/3 cup honey and salt to the mixing flour. Add to this another 2 bowls of flour, while constantly stirring to mix well and prevent any lumps. Once the dough is made, flour a flat surface (like the counter top) and knead the dough on it. Knead it until it easily pulls away from the flat surface but is not sticky. Place the dough in a greased bowl and cover. The dough will rise in the warm environment. Punch the dough down and lay it inside the 9 by inch pan. You can grease the pan before this so that it is easy to take out the bread after baking. Place the bread in the oven at 350 degrees. Bake for thirty minutes. Take out the bread and coat the topping with butter and margarine so that the crust remains soft. Cool the bread completely on a wire rack. Your bread is now ready to serve. Friends and family will love eating this fresh homemade bread with any type of topping like jam, jelly or cream cheese. You can also experiment a little with the ingredients and give your own twist to this delightful bread recipe.